Managers and employees in a large Midwestern manufacturing plant of the Fortune 100 company, as well as those in a Pennsylvania distribution company, learned Transcendental Meditation (company names withheld in accord with corporate policies). After 3 months the employees who learned TM were compared with a control group of non-meditating employees who worked at similar job sites, held similar job positions, had similar demographics (age, education etc) and similar personality characteristic before the study began. *Reference: Anxiety, Stress & Coping 6: 245-262, 1993. 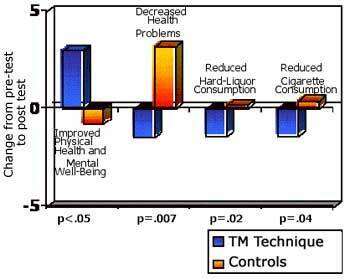 As found in other studies, the effectiveness of Transcendental Meditation in reducing anxiety, smoking and drinking, and in promoting personal development was substantially greater than other forms of meditation or relaxation.